Microsoft's annual subscription licensing program MCCA is changing in 2018. New cloud based services will be available after our program start date of July 1st. This page will be updated as our support process is determined. How can I join MCCA to receive these benefits? MCCA requires all Knowledge Workers in an Office/Department/Division be counted to join this program. Please contact ITS Software Licensing for more information. Microsoft 365 for Education A3 replaces the Desktop Package and includes Office & Windows OS and CALs (AD server client access license) as well as a host of online services. Please Note: ITS has not yet activated or reviewed security, privacy and support requirements for the Online Services. Access may be limited during the roll-out of this new program. All computers that connect to AD file share need CAL Suite license. Faculty/Staff enrolled in MCCA are entitled to Office 365 Suite that is available for download at portal.office.com. 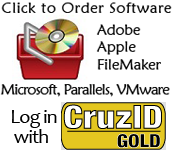 Sign In to the site with your CruzID & Gold password. You can be signed into Office 365 on up to 5 computers, 5 phones and 5 tablets that are personally or university owned. See the Office 365 Service Page for more info. If you have problems signing in or have questions, please request help. Division/department/office licenses all Knowledge Workers with the same software package. Any employee or contractor or volunteer who uses a UC owned computer or device for the benefit of the Institution or within the user’s relationship with the Institution. All Student workers & those who do not typically use a computer in their normal job function. Do Not Count Adjunct Professors in subscribed departments who only use Office 365 A1 Online.